It is PEAR season and I have three big pear recipes coming at you for this week’s Rise and Shine segment. So Thanksgiving is a little over a week away and folks are always looking for new ideas to add to their traditional meals. The three recipes I’m hitting you with this week are all dessert recipes and great for throwing into the family Thanksgiving mix when introducing something new… because everyone likes dessert; Basically the more desserts the better. Just make sure you still have Pecan pie! Here in Oklahoma City and in most mainstream grocery stores, we are able to choose from three different varieties: D’Anjou (red and green), Bosc, and Bartlett. 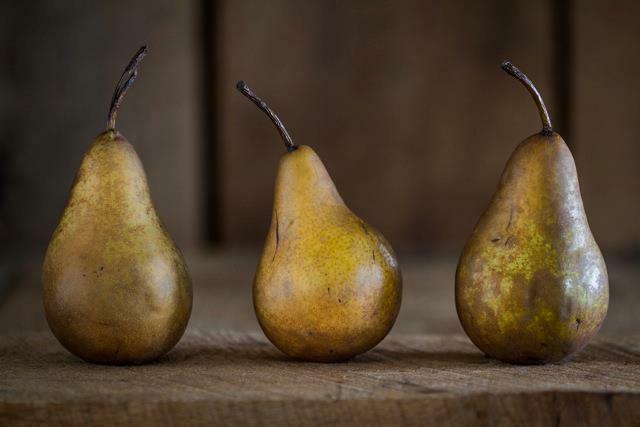 Now Pears are sort of like Apples when it comes to either cooking or eating fresh. They’re all great eating fresh and they all can be cooked. Some are just better than others. To check out the different varieties and characteristics please check out this website https://www.thespruce.com/pear-varieties-2216839 . Not that I’m too lazy to explain it to you… it’s just that I think you’re self-motivated enough to read about it yourself… and once again we have three recipes to get to. In a tall saucepan add the turbinado sugar, cinnamon, star anise, and split vanilla bean. Pour in the full bottle of wine and bring it all to a boil, then down to a light simmer. While the poaching liquid is simmering, carefully peel the pear smooth leaving the stem intact. Slice off about a 1/2” of the bottom of the pear just enough to allow the pear to sit flat. With a small knife or melon baller go up halfway inside the pear from the bottom and scoop out the core and seeds. Discard the core and seeds. Submerge the pears into the barely simmering liquid and cook for 20 minutes, rotating the pears every five minutes. Remove the pot from the heart and allow to cool to room temp. Cover the pot and place in the refrigerator for two hours or even better, overnight. When ready to serve remove the pears from the fridge and allow to warm slightly. Remove the pears from the liquid and let the excess liquid drip dry (pat the bottom with a bowl as to not bleed onto your plate). Place the pear on individual plates or all three on one large plate. Either add the custard sauce on the side or spoon out onto the individual plates and garnish with fresh mint. In a sauce pot add the whole milk, sugar, and split vanilla bean. Bring to a simmer without boiling over. Barely simmer to steep the vanilla bean for 10 ten minutes. Remove the vanilla bean and scrape out the vanilla bean caviar back into the scalded sweet milk. Discard the spent bean. In a large mixing bowl add the five large egg yolks and whisk vigorously until light and smooth. Temper the scalded milk into the egg yolks a little at a time until the milk is fully incorporated and the bowl is hot. Put the custard back into the pot and GENTLY cook the custard stirring all the while. DO NOT LEAVE YOUR CUSTARD! Scrambled sweet vanilla eggs is not a custard sauce. Pour the custard sauce through a fine mesh strainer to catch any solid bits, into a nonmetal container. Cover and chill. Lightly whipped (pourable) and sweetened heavy cream. Place the cranberries in a large nonreactive pot. Add the sugar, split vanilla bean, orange zest and juice , and the water. Bring the mixture to a simmer and cook until the berries have popped and are tender. About 20 minutes. Peel, cut in half and scoop out the center seeds area of each pear. Slice thick then dice thick. You will need about 2 full cups of diced pear. After the cranberries have softened and the mixture is becoming thick, remove the vanilla bean and scrape out the caviar. Add back to the compote along with the pears. Stir around to coat and combine the pears in along with the vanilla. Set the mixture aside to cool a bit and start working on the “crisp” topping: In a large mixing bowl combine the flour, brown sugar, salt, and oats; mix to combine. Add the cubed butter and with your clean hands “rub” the butter into the mixture making a nice crumble topping. Butter the inside of your favorite baking dish, top and sides, with the remaining two tablespoons of butter. Pour in the cooked cranberry and pear mixture. The pears will cook off in the oven. Loosely pour in the crisp topping making sure its laid in evenly and touches all sides of the dish. Bake in a preheated 350-degree oven for 50 minutes, or until bubbling on the sides and the topping has browned. Let the cranberry-pear crisp rest and set for at least 15 minutes before scooping out. Drizzle on the sweetened cream, then throw your mouth around some pre-holiday (or actual holiday) goodness! Preheat your oven to 425 degrees and line a baking sheet with parchment paper. Peel, halve and scoop out the center seed core of each halved pear. I find using a teaspoon measuring spoon as the “scoop” does a get job for this. Roll each of the halves in the melted butter and lay flat side up. Roast in the oven approximately 12-15 or until it starts to caramelize. Carefully pull out the hot pan and turn each half pear over to roast an additional 10 minutes. While that’s going on pour the maple syrup into a small sauce pot. Add the split vanilla bean and begin to slowly heat on the stove until a simmer. Simmer for 10 minutes then carefully remove the vanilla bean. With the back of a paring knife or regular dinner knife, scrape out the vanilla “caviar” and it back to the syrup. Turn the heat back on and simmer away to a thicker concentration, careful not to scorch. Once the pears are out of the oven, roasted and caramelized… and the vanilla maple syrup has reduced to a nice rich syrup, begin to plate. Add a pear or tow to a dessert bowl or dinner plate. Spoon over generously the tape vanilla syrup. Add tiger toasted chopped hazelnuts and serve with my homemade vanilla bean custard… which hopefully you have already made and it’s just hanging out in the freezer waiting for you. In a heavy bottom sauce pot combine the heavy cream and half-n-half, along with the vanilla bean, and bring to a light simmer. Remove the vanilla bean from the heat, and gently scrape out the vanilla bean caviar. Add the caviar to the scalded cream and mix in. Pour the custard through a strainer and back into the bowl. Place the bowl over an ice bath, whisking periodically to cool. Or you can make this custard base the night before, cover the surface with plastic wrap after straining, and refrigerate overnight. Pour the cooled custard into your ice cream maker, and freeze according to manufacturers directions. Serve with the warmed pears… or anything else you had in mind! Enjoy!